Allow experienced guide/outfitters Mike and Erin Thompson to take you on horse back through the wildest of Yellowstone National Park's backcountry. Come share the countryside with wild elk, buffalo, moose, bear, wolves, and trout! There is no substitute for hearing a wolf howl or glancing a grizzly in its natural habitat. However, where accommodations are concerned, don't think you'll be roughing it; we supply everything but your clothing and sleeping bag. You'll be served three hearty meals a day (custom made to suit your tastes) and your horse is chosen for you based on your personality and riding ability. 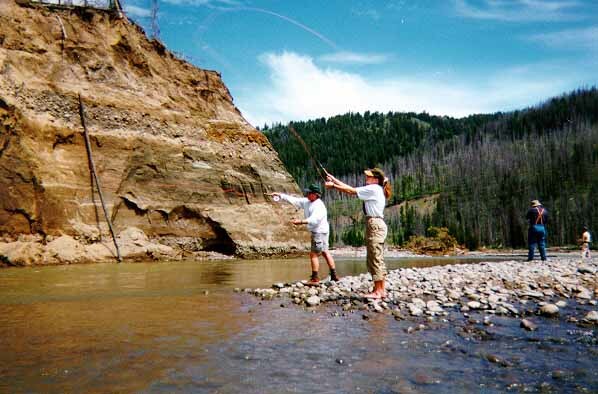 If outdoor education interests you, we put together specialty trips that include guest host experts from the Yellowstone area. The Thompson's and their crew are proud of their low impact techniques and receive ratings of excellent each year by the Yellowstone National Park backcountry rangers. Our season is short, but packed with adventure! Overnight trips begin July 1 and run through September. Give us a call at (406)848-9953, or email us at: packtrips@aol.com. We'll be happy to answer your questions.